Ladies and Gentlemen (and those not quite so sure which they are, and those too immature to be categorized as either, and any well-trained animals who have learned to surf the internet, and Jerry Springer, if you are reading this), welcome to the Change of Shift. I am honored to be hosting this week's celebration of the nursing blogosphere and thrilled that you could make it. So grab a seat (why were you standing, anyway? ), settle in, and get ready to meet some of blogging's brightest. I have only been an RN since last year, and at that only in the ER, but before that time I worked in rehabilitation of developmentally disabled adult criminals, as a CNA in Long-Term Care, as a Med-Surg CNA, as an ER Tech, as a Staffing Coordinator of a large hospital, as an LPN in a very busy Allergy/Pulmonology/Sleep clinic, as an LPN in Family Practice, as an LPN in Pediatrics, and as an LPN in Urgent Care. I've been around the nursing block a few times and have seen what a wide wide world it is. So I thought it appropriate that this week's Change of Shift should celebrate diversity, because nursing is certainly a field that has huge amounts of it. I'm not talking about black or white, conservative or liberal, gay or straight, Muslim or Catholic, funny or Braden, or any of those standards of diversity. I'm talking about the vast array of distinct careers that make up the profession of nursing. Most people have a fixed idea in mind when they say "Nurse" (just ask the Animaniacs) but they don't realize just how different a nurse in one area is from a nurse in another area. True, we all start from the same roots, and everybody's job description is filled with mumbo-jumbo about assessing, diagnosing, planning, intervening, and evaluating, but go ahead and look at what nurses say about their specific jobs and you may be surprised to learn how similar, yet different we all are. I have assembled a crack team of Nurse-blogging sharpshooters* and told each of them essentially the same thing. That is to share with the world why their kind of nursing is unique and special and what makes them want to do that more than any other field of nursing. I asked each nurse to submit this post to their own blog either last night or this morning, so I am almost as much in the dark as you are about what they will say. Unfortunately, I could not get a blogger for every type of nursing I wanted, so we'll just have to use our imagination on some of these. Emergency Nurses - Of course I start with what is nearest and dearest to my heart. Did you really think I would be that random? From the outset of my Nursing career, I never wanted to do anything other than ER Nursing - even when the big push came to rename our unit in a manner as to suggest that we need sildenafil - and it is all I have done as an RN. To introduce you to life in the unpredictable lane is EDNurseasaurus, the self-proclaimed "world's oldest diploma nurse and BSN undergraduate." Go for a prehistoric walk on the wild side and learn what makes her an ER Survivor. Her description of ER Nursing resonates very much with me and in a few short paragraphs, she paints a perfect picture of what life is like in the Emergency Room. On the other side of the water, my favorite impactEDnurse shares bits of wisdom and insight in his free e-book emergency nursing unscrewed. Or for those who appreciate their humor a little on the dark and dry side, go check out anything on Nurse K's blog, such as her latest tongue-in-cheek social commentary on poverty and inappropriate use of the ER. Critical Care Nurses - Tracey at Nighttimenursing has been through it all as a nurse in the ICU. In the unit, even more than the ER, you are the captain of your own ship, and when things start going south, there is you and the patient and not much else. Sometimes, even the most stable of patients can go downhill quickly, and just keeping them alive is a task that falls right into the nurse's lap. Tracey shares just such an experience and gives you a flavor of all a Critical Care Nurse goes through in moments like that, and what makes it all worth it. For a more nuts-and-bolts perspective, Nurse Sean (hey Nurse Sean, where did you go?) shares a day in the life of a new ICU Nurse on his blog and lays out in excrutiating detail why I don't want to be an ICU Nurse. ICU Nurse Kathy takes us back to the good old days when nurses would make a frequent practice of stripping with her post, To Strip, or Not? No, it isn't nearly as exciting as you might guess... in fact, it is actually quite technical and might make you wonder, "why are you giving free publicity to this travel agency by posting this?" To which, of course, I answer "so that I can make a joke about nurses stripping, of course. Oh, and because this gives some light into the technical world of ICU nursing and stuff." School Nurses - Alison at Schoolnurse's weblog talks a little about the mindset that a school nurse needs to have, while Penny at My Son Has Diabetes just made the switch from Home Health Nurse to School Nurse. It doesn't appear to be primarily a nursing blog, but you can read a little bit about her feelings on the change and her initial thoughts on the new job. Operating Room Nurses - If I didn't do ER, I would likely do OR. I had the chance as a Nursing Student to witness several surgeries, including a 4-way heart bypass, a brain surgery, a laparoscopic appendectomy and others. If it wasn't so darn hard on my feet, I would have been very interested in OR as my first priority. Of course, OR nurses do much more than just stand on their feet for a long time. 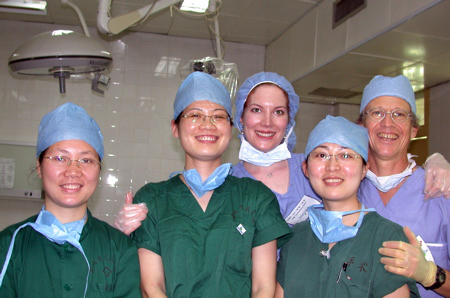 To give you an idea of what life is like in their shoes, Unsinkable Molly Brown at Livin' Large has put up a post to tell you what is so special about being an Operating Room Nurse in I Choose OR Nursing, and be sure to click the link halfway through to her post about the OR personality. Flight Nurses - Ready to swoop in at the most critical times to take care of the most critical patients, flight nurses are an amazing breed. When a Flight Nurse is called to the scene of an accident or to take a patient to a higher-level facility, they know they are going into a war zone and have to be ready to accept a patient on the verge of death, and keep them stable with absolutely nobody around to back them up. Crzegirl at Crzegirl, Flight Nurse has a two-part series about what a flight nurse is, first in words, then in pictures. 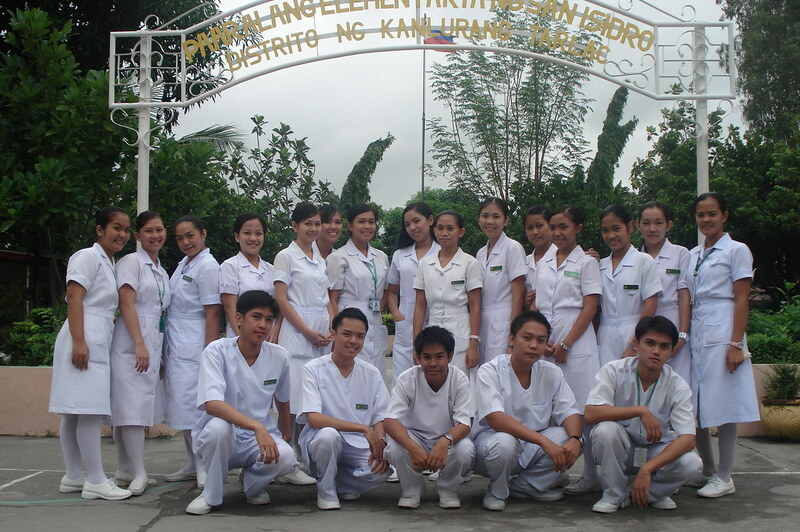 Med/Surg Nurses - It is almost unfair to lump all of the Med/Surg Nurses together. After all, this title can be given to Neuro Nurses, Ortho Nurses, Oncology Nurses, Surgical Nurses, Renal Nurses, and more. Fortunately for all you readers who do not have an entire 12 hour night-shift to kill, I'm not fair. Besides, I didn't get anybody to write a post for me about Med/Surg Nursing. I admire nurses who can do "floor" Nursing. I can't. I did plenty of it in Nursing School, and before that I was a CNA on the floor. For one thing, I can't fathom not being able to walk up to the Doc and ask a question. Using a telephone? It isn't my thing. Fortunately for me, it is for a lot of other Nurses. You can read about some experiences on Med/Surg by NewGradNurse at Call A Code. Also, Oncology Nurse Laura has a post about 1:1 patient care and how it harms productivity. I have to say that this hits home for me. I don't like getting mad at suicidal patients for taking away my ER Tech, but sometimes I do feel that way, and it makes me feel bad. So there are a lot of downsides to 1:1 nursing, but is there a solution that is feasible? Speaking of Nurse Practitioners, Max E. Nurse over at It Shouldn't Happen in Health Care has some thoughts on what was really meant... both for the patients, and for the providers (I especially love the translation for "There should be a bed on the ward for you any moment"). I like his blog much more than that of his cousin, Mr. Pad. 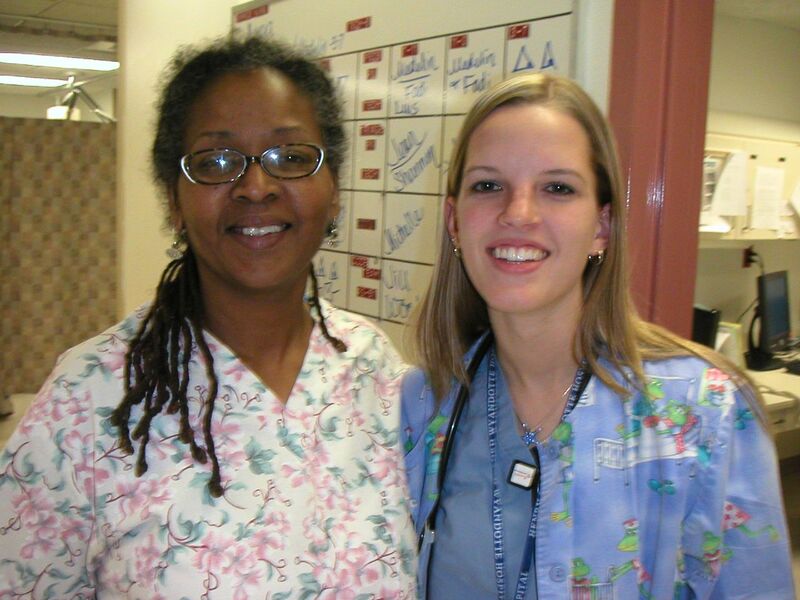 Public Health Nurses - Most nurses work with one or maybe a few patients at a time and in a controlled environment. Public Health Nurses work with everybody, and most of the time their patients don't even know that they are being watched over. Such is Sheila from Ordinary World, who shares her thoughts with us about why Public Health Nursing is important and what drew her in that direction in her post, Pump and Circumstance. Thank you, Sheila, for serving so many every day. Outpatient Clinic Nurses - Rae, an Oncology Nurse from the aptly named raecatherine wants to share her journey of discovering what kind of diversity Nursing has to offer. Follow her through her winding road, and learn why she is a Clinic Nurse, and even more why she loves Oncology in her post never say never and how I got there. Check it out to see her journey, check it out to see a cute pediatric nurse, check it out to get a new perspective on end-of-life care, but most of all, check her out to see today's best usage of the phrase "small poos". When you have read that, go and read her little warning about how we judge our patients, and how quickly the tables can be turned back on us. Student Nurses - Being a nursing student is not really a profession - or at least if someone is a student nurse for long enough to call it a profession, it is probably not someone that I want treating me - but Student Nurses bring to the table a special energy and interest and vitality that all-too-often fades as we get into the "real world" of nursing. La Bellota at Nursing School Chronicles recently graduated and started looking for work. Not too long ago I was in her shoes (they were a bit snug on me, I must say), and I remember the joys and the heartaches and, of course, the odd timing of everything falling into place, and then falling all apart. Read her five-part tale (1 2 3 4 5) of NCLEX to hiring as a brand new grad. Honesty and integrity in nursing? Who would have thunk it? Now let's go one step further with Nursing Student loco lorenzo from the loco days of locolorenzo and his thoughts about the power of love. I think this is a specialty of nursing students... and perhaps something that we should seek for in our profession as actively as we seek after the alphabet soup that comes after our names. And while we are talking about Student Nurses, let us all give a big welcome to Nursing Student Kaitlyn, who just wrote her first post on the Learning to Fly blog, and after an apologetic beginning, she gets right into a beautiful discussion on what Nursing really means and how it has already changed her life. Finally, to all you Student Nurses out there, please take a few minutes and head over to prn penguin's place to read her extremely well thought out and educational post on how to survive as a 1st year nursing student. Then read it again. Administrative Nurses - Where would the nursing world be without managers? Perhaps it is best if you don't answer that question. Anyway, many nurses become Nurse Administrators and help to keep hospitals and clinics running smoothly. My brother was a manager of a busy inpatient surgical floor of his hospital. Of course, in an attempt to save money, the hospital made him work as Charge Nurse three days a week and Manager two days a week and there was no way to do everything a Manager needs to do in just two days, so he saw the light and now works at an ER 20 miles down the road from me. And working nights nets him the same salary he was getting as manager. Wait, do I digress? Perhaps that is because I was not able to find a blogger to represent Administration. One interesting blog that I found, however, was Paul Levy's. He is CEO of a large Eastern US hospital, and shows a remarkable amount of approachableness (made up word of the day) and transparency on his blog, Running a Hospital. Travel Nursing - Do you remember that Army kid in school? The one who came in halfway through the year and then moved just before school ended? Yeah, that's like the Travel Nurse. They can be in any department, but like the sale at Macy's, they are for a limited time only. It is a fascinating lifestyle, and invariably makes the rest of us lesser-paid Nurses jealous, and I'm sorry to not have a blogger to introduce it to you. However, for those who are attracted to the magical aura of Traveldom, Christina from NursingDegree.net shares a huge list of resources for you. Alternative Nursing Careers - Hueina Su is not only a nurse, she is also a Certified Empowerment Coach (yeah, I had to look it up, too). She submitted an article about the power of the mind, and how Nirvana is Only a Thought Away. Holistic/Alternative care is not necessarily my cup of tea (no pun intended), but there are plenty of people who find happiness and healing through it, so go see what she has to say. Besides, how can I say no to a CEC? Everybody Else - The list of different types of nurses could go on and on, and so in the interest of time and lack of volunteers, I will recommend to you Mother Jones at Nurse Ratched's Place for psychiatric nursing, May at about a nurse for telemetry nursing, At Your Cervix for Labor and Delivery Nursing, and The Mayor of Crazytown at All That Matters To Me for Home Health Nursing. Respiratory Therapists -You hear it all the time in the hospital: "Respiratory Therapy to room 704." Where do these angels with the vents come from and what were they doing before magically appearing at your bedside to help save your crumping patient? Keepbreathing at Respiratory Therapy 101 wants to help us nurses know just what it is that RT is all about. Not only does he do a masterful job explaining the ins and outs of his profession, but he does so while correctly using the word plethora. Bonus points. Go check out A Nurse's Guide to Respiratory Therapists. Social Workers - Until I started working in the ER, the Social Workers were just this nebulous group of people that did stuff sometimes. I never really understood their role. Now that I have interactions with them every day as I dump suicidal patients and drunks and battered wives on them, I have nothing but respect for what this stalwart group does. Hoping to help you understand a little bit, Still Dreaming, "a brand new social worker working with the lowest of the low" took the time to write a post especially for you at Awake and Dreaming about what it means to be a Social Worker. Go over to her place and get educated with I'm a What What Worker? And don't forget that some Social Workers come in the Doctor variety. Therapydoc at Everyone Needs Therapy (ain't it the truth) wants you to know why Alice the waitress in room 7 has suddenly become Olga the conqueror. Medics - What? I included the ambulance drivers? That's like putting a picture of Manny Ramirez on a Yankees Blog! But wait... not so fast there, cowboy. Perhaps we can work some of our differences out. At least that is what Epijunky from Pink Warm and Dry hopes as she introduces you to the elephant in the room. You are right, Epi, we do have a lot in common. And thank you for that entertaining and insightful look into what EMS is all about. Any nurse who understands the life of a medic will have nothing but respect for them. 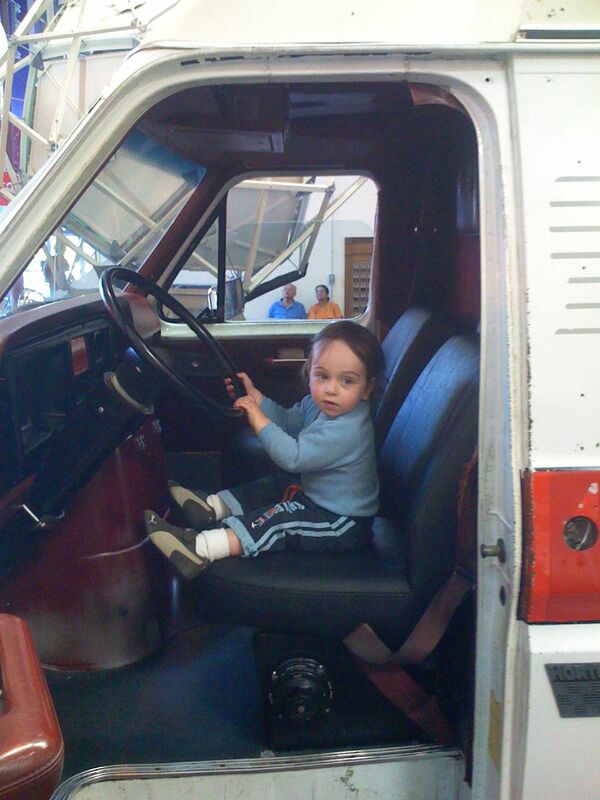 And for another not-to-miss post from Epi's world, check out her tour of the inside of an ambulance. Humor and education all in one... who could ask for anything more? Emergency Doctors - I didn't get anybody responding to my call for ER Docs, but please check out Scalpel or Sword or 10 out of 10 to get some insight into the mind and madness of those suture-wielding warriors we call Emergency Physicians. Somewhat related, JC from Brain Blogger has a philosophical question as relates to Emergency Room Doctors. What do you do when a patient comes in who requires a specialty doctor, but you don't have one on call? How long can your patient wait for surgery? Hospitalists - The Hospitalist is a fairly recent invention. Back when I was a kid, the PCPs admitted their own patients and then came around the hospital to see them before or after clinic hours or between tee times. This meant that a patient who needed to see the Doc at 0800, was granted immediate access to his or her doctor... at 1800. Fortunately, now we have Doctors who do nothing but help inpatients. The PCP or ER Doc decides to admit a patient and from that point, the Hospitalist takes over and does everything that is needed to help the patient and the Nurses achieve good outcomes. From all that I have seen and heard, this program works very well and results in shorter hospital stays and happier patients and Nurses. The Happy Hospitalist is an interesting and popular blog that chronicles the adventure of one such brave soul. Have fun. Parent nurses - Sometimes, the most unwilling Nurses can be the most caring. Parent Nurses have no training in Nursing, and do not even choose the path they take, but for love and devotion to patients, nobody tops Mom and Dad. It is every parent's worst nightmare to have a child who suffers from chronic conditions, but it can also be one of life's biggest blessings. Hannah's Dad at Kintropy In Action writes about what it means to be a Parent Nurse and how it can change a life in Our Unexpected Nursing Career. After reading about their journey, go and feel the joy with the family when you read about finally giving up the ventilator. And I'm not sure I can think of a better note to end on. Thank you for taking this journey with me through the amazing and inspired world of Nursing. One thing really stood out for me as we walked along the road of Nursing, and that is that nearly everybody who posted articles trying to explain why they do what they do said the same thing: I want to make a difference in people's lives. And that, my friends, is truly what it is all about. * Submitters were selected using a scientific method I call complete randomness. Generally I tried to find nurses who update their blogs regularly, who seem relatively articulate, who have a blog generally devoted to one specific kind of nursing, and as much as possible who do not receive a lot of traffic to their site (with a few notable exceptions). Endless thanks to all who took the time to help build the theme for this Change of Shift. If you feel snubbed or if I did not include your particular brand of nursing, please feel free to write a similar post on your blog and link to it from the comments. Pictures found using image search on Flickr. If I'm using your picture and you don't like it, please accept my apologies and let me know and I will take it down. Final picture borrowed from Careways Trust. Certainly worth a stop by her place for. Wow - this is something else! Fantastic and thank you for hosting! Thumbs up for including parent nurses. I had a student nurse ask me if I had had any nursing training when I was helping my son's PICU nurse explain his heart defect. I told her that I had been to the nursing school of hard knocks. What an impression collection. Great to see other provider perspectives, and 'non-traditional' nurses. Thanks very much for including us in this edition and highlighting parent-nurses. I appreciate the opportunity to talk about our experience and learn from the many fantastic nursing professionals as well. Great hosting job! I just discovered your blog via Change of Shift, and will blogroll you on my blog and on Nurse LinkUp where I'm an editor, writer and administrator! GREAT JOB!! Loved this edition of COS! Great work - very comprehensive. This is a very valuable resource for anyone considering nursing. What a great Change of Shift! Thanks for the invite. It is a very educative compilation of the different types of nursing and I look forward to reading all the posts. I could have included a Med/Surg entry had I known you needed one! Did that for 6 1/2 years before I become a FNP.. Most excellent Change of Shift!!! Braden--thanks for checking out the new blog. I'm very excited to share my experiences in skilled nursing with the nursing blog community. I've enjoyed your posts, and will add you to my blogroll as well. Have a great weekend!! Great job, Honey! Looks like the 200 hours you put in paid off! :) Ha, I kid. But it does look very comprehensive and informative. I look forward to reading it sometime when our 1-year-old deigns to let me use the computer. "I like his blog much more than that of his cousin, Mr. Pad." I wasn't aware that his cousin had a blog. I have, however seen him on tv commercials WAY too often lately. Good job on CoS. Great corny jokes hidden in there. Strong work. Wow, this Change of Shift was great!! I am a new nurse and new to the whole blogging world- it's great to see so many different types of nurses out there blogging! I can't wait to read them all! Thanks! Seriously, are you even trying?